Home » Posts tagged "Portugal"
Portugal: Poor presidential judgment or fall of democracy? 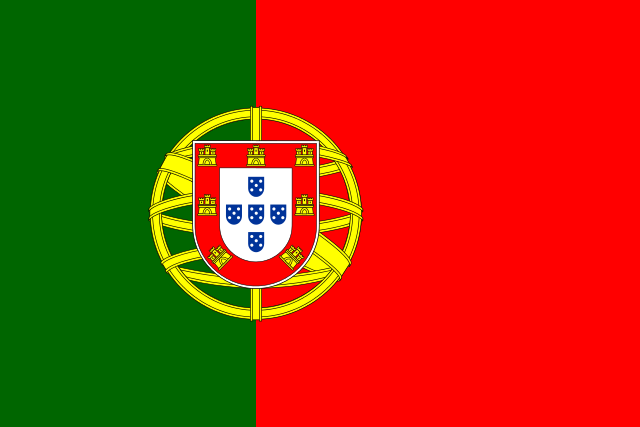 And now we turn to my beloved Portugal. Are dramatic headlines of Portugal’s democracy being subverted to EU neoliberalism fair or a tempest in a teapot? I’m not sure this take on the situation is exactly accurate (as I’ll get into below), but let’s take a look at the explanation provided in the column. He deemed it too risky to let the Left Bloc or the Communists come close to power, insisting that conservatives should soldier on as a minority in order to satisfy Brussels and appease foreign financial markets. Democracy must take second place to the higher imperative of euro rules and membership. Mr Cavaco Silva argued that the great majority of the Portuguese people did not vote for parties that want a return to the escudo or that advocate a traumatic showdown with Brussels. This is true, but he skipped over the other core message from the elections held three weeks ago: that they also voted for an end to wage cuts and Troika austerity. The combined parties of the Left won 50.7pc of the vote. Led by the Socialists, they control the Assembleia. While I’ve expressed or anticipated very similar concerns about balancing democracy and the demands of the European Union’s technocracy upon national governments in other situations, I’m not quite ready to jump on this op-ed’s bandwagon. Why? To me, it seems potentially like it might be an over-reaction or at least misdiagnosis of the situation. Here’s what I notice about it. The conservative premier, Pedro Passos Coelho, came first and therefore gets first shot at forming a government, but his Right-wing coalition as a whole secured just 38.5pc of the vote. Yes the PSD and their allies lost seats, but it’s not like the Socialists and their allies won a convincing victory and are now being denied out of hand the chance to govern. Lastly, even if his motivations or rationale are dubious, President Cavaco Silva identifies a legitimate quandary with coalition governments: If the vast majority of the country didn’t vote for a (relatively) radical party with sharply divergent policy views from the larger parties, should the country then be taken along for a ride on the agenda demands of a junior coalition partner? That’s certainly something I question whenever a far-right party ends up in coalition with a center-right party. It just happens in this case that the Communists or Left Bloc (who would be the two junior partners of the Socialists) want to leave the euro and a bunch of other econo/fiscal things, rather than proposing some Portuguese version of the Sweden Democrats or whatever. All that being said, the bigger thesis of the column, beyond the shock headline and opening, is actually about how the damaging austerity regime will continue under the center-right government, which is bad news for Portugal. I pretty much agree with that part. Also, I agree that if the Socialists, Communists, and Left Bloc parties all stick together in the opposition and manage to block major PSD agenda items and budgets, then the minority government under the PSD would probably stumble quite badly and struggle to survive confidence votes, which is not ideal. (And constitutionally there can’t be fresh elections for almost another year.) And that may well be a good reason to let them form a government now. But it doesn’t require it per se. And the three-party alliance may fall apart anyway. Fort São João Baptista de Ajudá was an early 18th century Portuguese fortress embedded within the city of Ouidah in Dahomey. The latter was an African kingdom that had itself just conquered the coastal city when Portugal was granted the territory for a fort, and then it became a French colony until 1960, and it was ultimately renamed Benin in 1975 during the country’s Marxist revolution. While the fort zone and city were influential, initially, in the history of Portuguese slaving in West Africa and in the kingdom’s interface with the European powers, the fort was soon handed to a Brazilian company and later abandoned — whereupon it fell into disrepair until Portugal reclaimed it in the 1860s. But after this brief restoration to power, it rapidly lost influence and territory as France came to power in the kingdom around it. Even a late 19th century effort to establish a Portuguese protectorate over the city ended with complete French control of everything outside the physical walls of the fort. Quietly, Portugal began disengaging and pulling out but continued to assert authority over the “territory” into the second half of the 20th century. When French Dahomey was decolonized in 1960, the fort at “Ajudá” was still a Portuguese-ruled enclave in Ouidah, and the Portuguese dictatorship was very determined to retain all its overseas possessions (most of which were then in or approaching open revolt, or had already been annexed to other liberated countries). However, despite its military and strategic origins, São João Baptista de Ajudá proved neither very valuable nor defensible a year later when Dahomey’s new republican government demanded control of the enclave. Mainly because it was infinitesimal in size and had almost no people. That being said, those still there seemed pretty darn determined to not go down without a fight … a really, comically pathetic fight. Until its annexation by Dahomey in 1961, São João Baptista de Ajudá was probably the smallest recognized separate modern political unit, initially around 1 km2 and being reduced until only 2ha (5 acres) by that time: according to the census of 1921 it had 5 inhabitants and, at the moment of the ultimatum by the Dahomey Government, it had only 2 inhabitants representing Portuguese sovereignty, who tried to burn it rather than surrendering it. When the fort was captured, they were hastily escorted to the Nigerian border and expelled from the country. So…not exactly the Alamo or 300 Spartans against the Persian Empire. I assume that the lesson “pick your battles” was not taken to heart by those two residents and their five-acre colony. In the end, the fort was not burned and was eventually restored as a historic site with funds from the post-colonial Portuguese government some time after the 1975 transition to democracy. 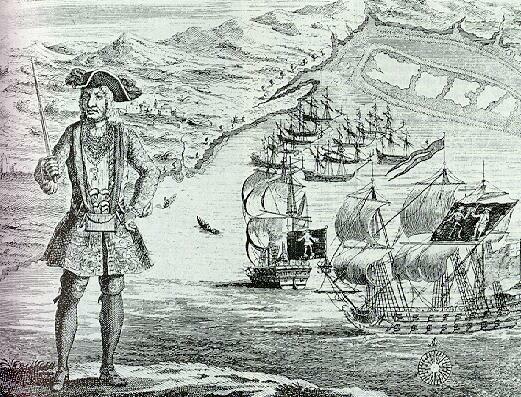 Dramatic engraving of Pirate captain Bartholomew “Black Bart” Roberts, following his capture of 11 ships outside the Portuguese Fort at Ouidah in the other dramatic episode it is famous for. Engraved by Benjamin Cole. Can Guinea-Bissau’s new civilian president dump the military leadership? One of the major challenges in trying to reform a country’s military to keep them from interfering with governance is whether the meddlers can be removed without them meddling again. Guinea-Bissau’s Army chief, General Antonio Indjai, who was indicted last year in U.S. court for a scheme to send weapons and drugs to Colombian rebels, has been relieved of command by President José Mário Vaz of Guinea-Bissau this week. The latter only became president in June of this year in free elections after defeating the military’s candidate. He was a finance minister in an earlier government before it was overthrown. Guess who overthrew that government? Why, none other than General Indjai. In fact, Indjai staged the military coup in 2012 — which blocked presidential elections from being completed — in response to an earlier effort to reform the military under the supervision of Angolan advisers and troops. (Angola is a fellow ex-Portuguese colony that became independent about the same time.) In 2010, Indjai staged a mutiny to become army chief in the first place. Will he go peacefully this time? The better bet is probably no, but perhaps Vaz has an ace up his sleeve and is confident he can make this go off without a hitch. To replace General Indjai, President Vaz appointed a close ally and veteran soldier from the country’s war for independence, which ended in 1974 with the overthrow of the Portuguese home government. The appointment of General Biague Na Ntan, 61, an ethnic Balanta like Indjai, could smooth over any resentment from the ethnic group that makes up about 60 percent of the army and security forces and 25 percent of the population. He had been commanding the presidential guard prior to his promotion to head of the army. Far across the continent of Africa, the leader of Lesotho also recently tried to fire the head of his country’s armed forces, only to find himself fleeing a coup attempt, which has now divided the military’s loyalties. That crisis, which has still not been resolved, has to be weighing heavily on the mind of President Vaz in Guinea-Bissau as he tries to remove his own army chief and past coup leader. As an additional stressor, Guinea-Bissau remains on high alert right now for any signs that the Ebola outbreak might have arrived from neighboring Senegal or Guinea-Conakry, the outbreak epicenter. Slovakia: You get a car, you get a car, everybody pays their taxes. Gotta love clever governance solutions. Slovakia is trying to fight business tax cheats who are pocketing value-added (sales) taxes, which hurts both consumers/manufacturers and the government. The country came very close to requiring a bailout last year because its economy and debt situation was such a mess. So their revenue loss solution was to host a lottery with huge prizes, from almost $14k cash to a new car and more. The only thing you had to do to enter was upload receipts for things you had purchased with VATs on them (almost everything). The government then checks to see if the business paid up the tax listed on the receipt (and the buyer can report fake tax numbers, too). The consumer is entered to win either way.﻿ You can enter over and over by uploading lots of receipts — which is why nearly half a million people have uploaded 60 million receipts since the program began last year. Tax collection began to increase early in 2013 and rose more sharply after the lottery began. Officials say they collected about $512 million more in 2013 than in 2012. How much of that is a result of the lottery may never be clear. But Mr. Kazimir said that it was surely a big factor, and that it had cost only about $276,000 to get the lottery going. He said the new influx of complaints had already proved that it was not just small businesses that were cheating: Chain stores have also been caught giving fake receipts. It’s been so successful that Portugal just launched its own lottery this past week. The lottery project has drawn criticism from some Portuguese opposition politicians who say it is a capitalist tool to turn citizens into tax inspectors. Hell yes it is… and there is nothing wrong with that. Tax evasion is a cancer on democratic societies because it both undermines confidence in the fairness of the taxation system and erodes the government’s ability to invest in infrastructure and provides services, which reduces its credibility. And it’s even worse when that evasion is on value-added taxes that consumers and manufacturers have already had to pay up front, without the government seeing a dime. It’s essentially theft from the people, really. Arming ordinary citizens with the power to help enforce tax compliance strengthens democracy and governance. Doing it in such a light-handed way is brilliant and virtually painless. The only people who lose are those who are already breaking the law and stealing revenue. You get a car, you get a car, everybody pays their taxes.